I’m all settled in now after my first week in Singapore. It has been a very hectic but enjoyable week. When I arrived I was met by my National University of Singapore (NUS) buddy. They stayed with me for half a day and were incredibly helpful. Not only did they help me get to my accommodation but they showed me around campus, pointing out all the major places which saved me a lot of time and made getting around a lot easier. They also helped me get an EZ-link card (allows you to get on public transport) and a Singaporean phone card which really helped. On the second day I went on a tour of the city for exchange students which helped with getting to grips with the MRT (trains). There is an MRT station only 5 minutes’ walk away which has made exploring the city quick and easy. The tour started at 9am and finished at 5pm at the Marina bay so we were all pretty tired, but when we got to the bay they were setting up for a rehearsal of the Singapore Day Show so we stayed to see the jets, boat and fireworks which were all very impressive. On the next day, I went to Senatosa Beach which is at the end of the same MRT line that the university is on. The Beach was wonderful but slightly unnatural with lots of buildings and boats around. The next few days were spent registering for the university, applying for my student pass (like a visa) and applying for modules. This was a bit of a long process for everyone involved but it was done all in one go so was relatively painless. The positive to this though is that your student card you get allows you free entry into all the gyms and sport facilities around campus, which is a welcome change. 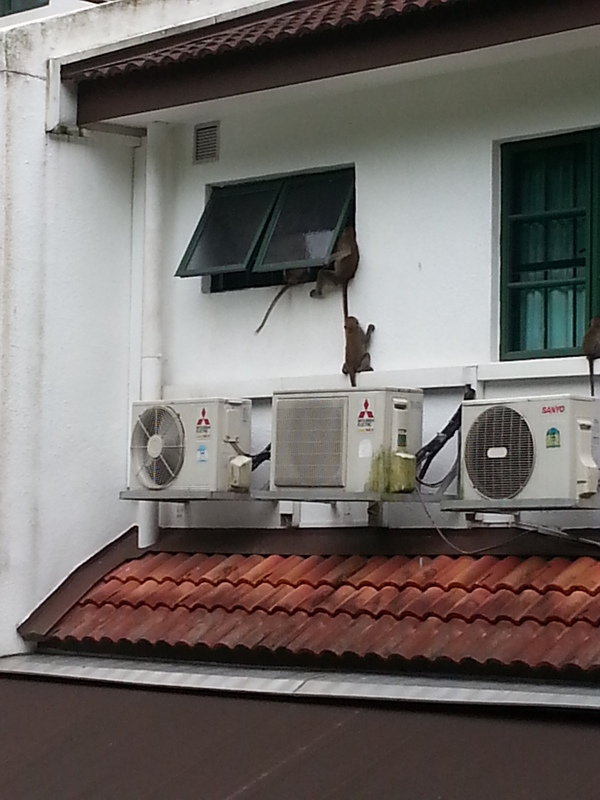 One interesting place was Bukit Timah Nature Reserve where you can see the monkeys. Once you get of the city in Singapore there is lots of rich wildlife and rainforest. One of the more interesting sights was watching monkeys trying to get into someone’s house through a window! Everyone here is very helpful and friendly and it seems such a safe city. An example of this is a bridge in Clarke Quay where people sit and chat to each other. There have been loads of other trips that I’ve done and am planning to do, but with lectures fast approaching it may be time to get my head down (whilst still having fun! ).